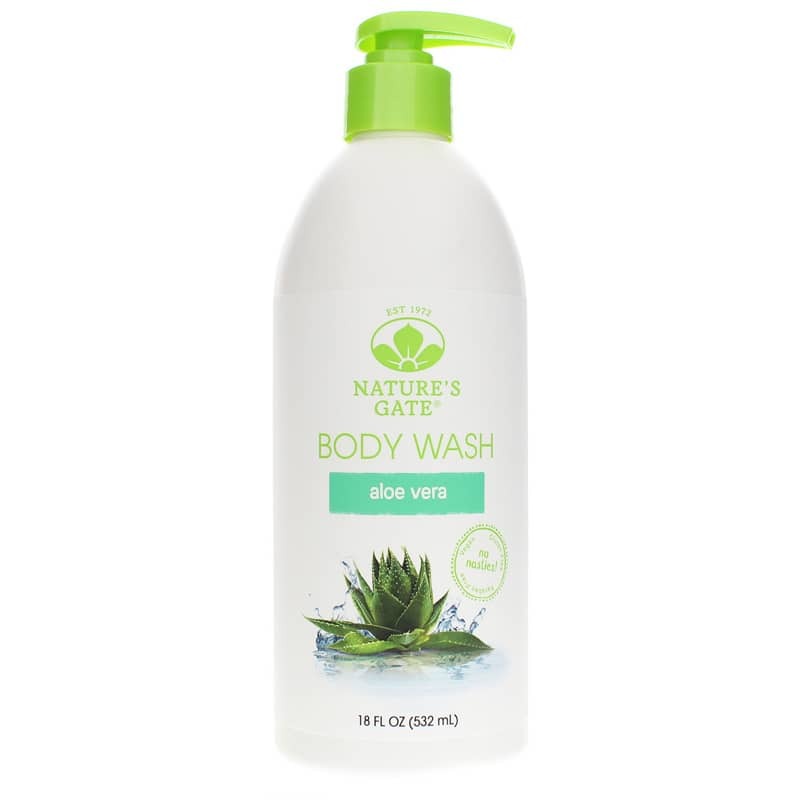 Nature's Gate Aloe Vera Body Wash is a natural body wash featuring an ultra moisturizing, creamy formula that gently cleanses while Cucumber and Aloe soothe skin. This luxurious, lightly scented formula is enriched with 7 skin conditioning moisturizers to leave skin silky, soft and radiant. Cucumber and Aloe Vera soothe skin. The exclusive moisture blend includes Shea Butter, Sweet Almond Oil, Apricot Kernel Oil, Soybean, Oil, Sodium Hyaluronate, Vegetable Glycerin and Vitamin E.
Apricot Kernel Oil is an exceptional skin conditioner, contains high levels of Vitamin E and delivers nourishing moisture. Vitamin E provides potent antioxidant and skin hydrating properties. Shea Butter is a penetrating emollient rich in Omega-6 and Omega-9 Essential Fatty Acids. It helps naturally renew cells while moisturizing and softening the skin. Sweet Almond Oil is high in Omega-9 and Oleic Acid. It easily absorbs into skin to moisturize and hydrate. Soybean Oil is high in Linoleic and Palmitic Acids, it is readily absorbed delivering smooth, soft skin. Glycerin is a natural moisture binder derived from vegetable oil, and helps skin retain moisture. Sodium Hyaluronate delivers the ultimate moisturizing power of nature. It binds moisture to skin, hydrates and protects skin from water loss. Water (Eau), Cocamidopropyl Hydroxysultaine, Sodium Cocoyl Isethionate, Glycerin, Disodium Cocoamphodiacetate, Lauryl Glucoside, Polysorbate 20, Aloe Barbadensis (Aloe Vera/aloes) Leaf Juice, Cucumis Sativus (Cucumber/concombre) Fruit Extract, Chamomilla Recutita (Matricaria/matricaire) Flower Extract, Sodium Hyaluronate, Butyrospermum Parkii (Shea/karite) Butter, Prunus Amygdalus Dulcis (Sweet Almond/ amande douce) Oil, Prunus Armeniaca (Apricot/abricot) Kernel Oil, Glycine Soja (soybean /feve de soja) Oil, Hydroxypropyl Methylcellulose, Tocopheryl Acetate, Malva Sylvestris (Mallow/grande mauve) Flower Extract, Glycyrrhiza Glabra (Licorice/reglisse) Root Extract, Sodium Lauroyl Sarcosinate, Glyceryl Undecylenate, Sodium Hydroxide, Phenoxyethanol, Citric Acid, Fragrance (Parfum)*. Pump a generous amount onto washcloth, sponge or pouf. Lather. Rinse thoroughly. Follow with Natures Gate lotion.